Route 66 Association of Missouri's 20th Anniversary Tour, September 11, 12 and 13, 2009. Twenty years ago, some folks got together at a truck stop in Mt. Vernon, MO to talk about the “future” of Route 66 in Missouri. From that meeting, and a subsequent meeting at the Tri-County Truck Stop west of Pacific, emerged the Route 66 Association of Missouri. Today the Association is 600 plus strong, has done a lot to promote and preserve Route 66 in Missouri, and is celebrating its twentieth anniversary on its annual Motor Tour. This year's tour will be held September 11th 12th and 13th, will start in Joplin, MO and end in Pacific, MO. Tour registration begins on Friday, September 11, at 4:00 p.m. at the Holiday Inn in Joplin, MO (3615 Range Line Rd. ), where a block of rooms has been reserved for tour goers. Registration will go until 10:00 p.m. In addition, tour participants will be welcome to pay a visit to the 4 Women On The Route’s Kan-O-Tex station in Galena, KS for a little food and a great time Friday evening. More information on activities will be available at registration. On Saturday, September 12, tour registration will resume at 7:00 a.m. at the Holiday Inn, and the tour will depart promptly at 8:00 a.m. from the Holiday Inn. This years motor tour will be making several stops between Joplin and Pacific, Mo, at places highlighting the history and accomplishments of the Route 66 Association and those along Route 66 in Missouri that have come and gone over the past 20 years. Details on these stops will be included in your Motor Tour Agenda Folder available at registration. In addition, a APassport@ will also be provided at registration that participants can have stamped at many of these stops. The passport will contain valuable information about the history of the Route 66 Association and Route 66 in Missouri. There will also be information about other recommended stops provided at registration. One of the tour’s first stops will be at the Jasper County Courthouse in Carthage, one of the great architectural marvels to be found along Route 66. From the Courthouse, the tour will proceed caravan style to Spencer, leaving the Courthouse approximately 9:30 a.m. The tour will make its midpoint stop in Lebanon, MO. We have arranged for a block of rooms to be held at two motels for Saturday night, those being the Munger Moss Motel (1336 E. Route 66) and the Best Western Wyota Inn (1225 Millcreek Rd (just off Route 66). Saturday night=s dinner will be held at the pavilion at ATCHLEY PARK, on Highway 5 North of Lebanon (approx. 7 miles), where we will be able to enjoy some fine Bar-B-Cue served up by the folks at the Sand Spring Resort. On Sunday after the 8:00 a.m. nondenominational worship service, the motor tour will proceed caravan style from (the recently-closed) Wrink’s Market in Lebanon at 8:30 a.m. to the Witmor Farms Restaurant in Waynesville. From there, tour participants will proceed on their own to the Tri County Truck Stop West of Pacific . En Route, you are welcome to stop for a midpoint refreshment stop at the visitors center in Rolla. From the Tri-County Truck Stop, the tour will proceed caravan style through downtown Pacific to the Depot Park in Pacific (just south of Route 66, across the railroad tracks on CR F(1st St.), where a lunch stop will conclude the tour between 1:30 and 2:00 p.m. The designated stops and caravans are highly recommended, but all tour participants are free to cruise at your own pace and select their own stops. Additional information on any planned stops or activities along the way will be made available at registration. For more information contact Kip Welborn (314-776-7385, rudkip@sbcglobal.net), Jane Dippel (314-843-7132, vestaon66@cs.com) or visit our website (where you will find a registration form you can download) at www.missouri66.org. Here’s hoping that you can join us while we're "cruisin' like its 1989!" Just wanted to bring this topic back up to the top & report WE'RE THERE! Sent our registration in today & we're really looking forward to meeting up with everyone next weekend. I threw caution to the wind & disregarded that 8/15 deadline....I figure they won't turn anyone away. If you're in the area and have a 3-day weekend to kill, I highly recommend attending this cruise. AR Forum member Kip Welborn and his cohort Jane Dippel do a great job in putting this together. 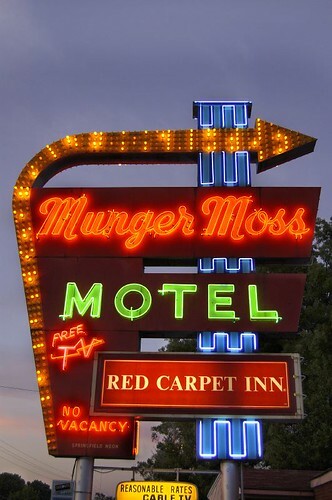 And as an added bonus, the Saturday night stop is in Lebanon where you have the chance to bunk up at the historic Munger Moss Motel. Hope to see YOU there! I'm jealous! Have fun everybody!!! We'll be looking forward to hearing all about it. And, send our best to Ramona at the Munger Moss. 529 miles in the books and we made it to Joplin! The motor tour starts bright & early at 8am, so I'm off for a sound night's sleep. I've got Day 1 pics up on Flickr, which cover US 40, Route 66, and parts of I-44 (to make up some lost time!). You got some fine shots! I think I liked the Wagon Wheel Motel the best. Not fancy, but real. Bravo! More photos from Day 2! There are roughly 60 cars and around 100 people on hand for this year's tour. That's a big jump over the last couple of years. Several AR forum folks on hand for this event. Hats off to one of those AR forum members...Kip Welborn...for putting this thing together. Weather's been perfect & everything's gone according to plan. Looks like everyone had a great time. Sorry I missed it. I know it's something I have to work into the schedule some day.